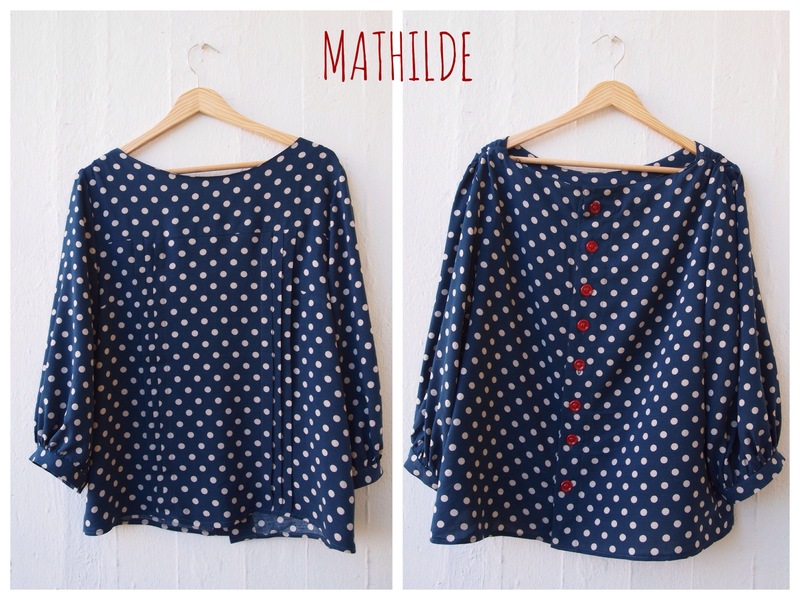 I loved the Mathilde Blouse when Tilly made it in The Great British Sewing Bee. Then I found her book kind of randomly and bought it right away. I hoped the Mathilde Blouse was in the book so when I realized it wasn’t I sent away for it along with Coco. Flash forward a few weeks (months?) and I had finally bought some nice fabric and was ready to go. Unfortunately it wasn’t all smooth sailing, I messed up one side of the pleats by measuring wrong, I accidentaly cut a whole next to an armpit and so on. But worse of all was that I made it a size or two too big *facepalm*! The most noticable part of this was that the shoulders drooped. So I tried to save it by adding an elastic to try to bring it up a bit. I don’t really know if it helped or not. It was a really fun pattern to sew though and I will definitely make it again and this time learn from my mistakes. Maybe I’ll even make a muslin first (the horror!). 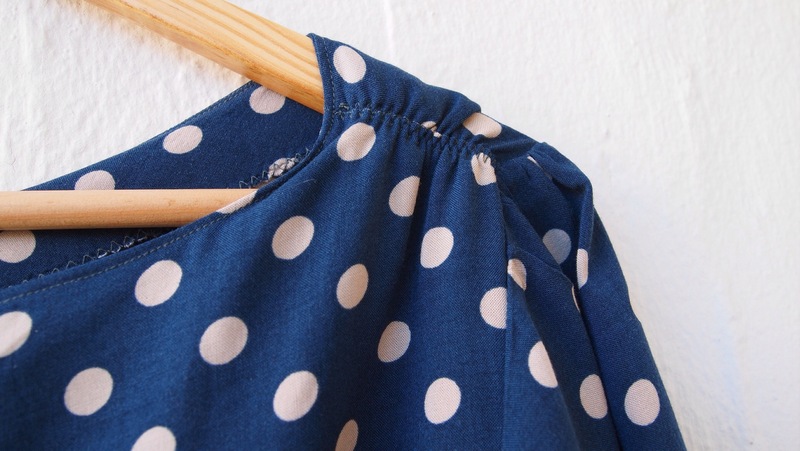 Categories: Home Sewn, LyllosMig, Sewing, Tilly and the Buttons | Tags: Blouse, Great British Sewing Bee, Mathilde, Tilly, Tilly and the buttons | Permalink. There are only a few more days in August and I guess that means that the summer is more or left over for this year which also means that it is about time I finish my Summer Wardrobe Challenge. It was pretty much over a month and a half ago when I started my vacation and I took these pictures right before but then I went into vacation mode which meant I couldn’t allow myself to blog, I am very sorry for the delay, mostly for myself since I kind of let myself down, the main purpose for the challenge was so I would sew and blog more than usual. At least I sewed more and I got some cool summer clothes out of it! Let me go through the last few pieces of my summer wardrobe. 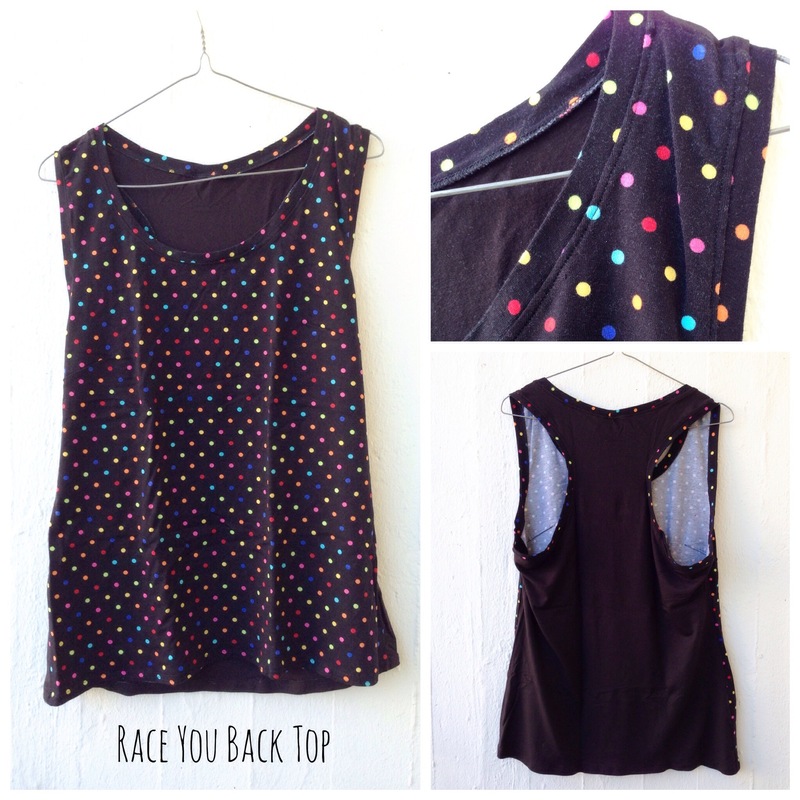 Race You Back Top – I’ve had this jersey fabric for a year or so and couldn’t really figure out what to sew out of it, finally I figured I would try sewing this tank top from a recent Burda Style magazine. 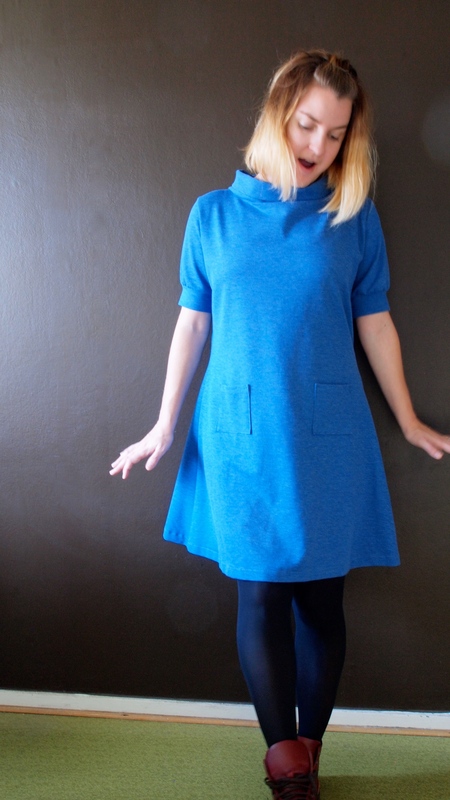 It was really easy to sew but I changed it up a bit at the neckline and armholes. I made the back black because this fabric is really loud. 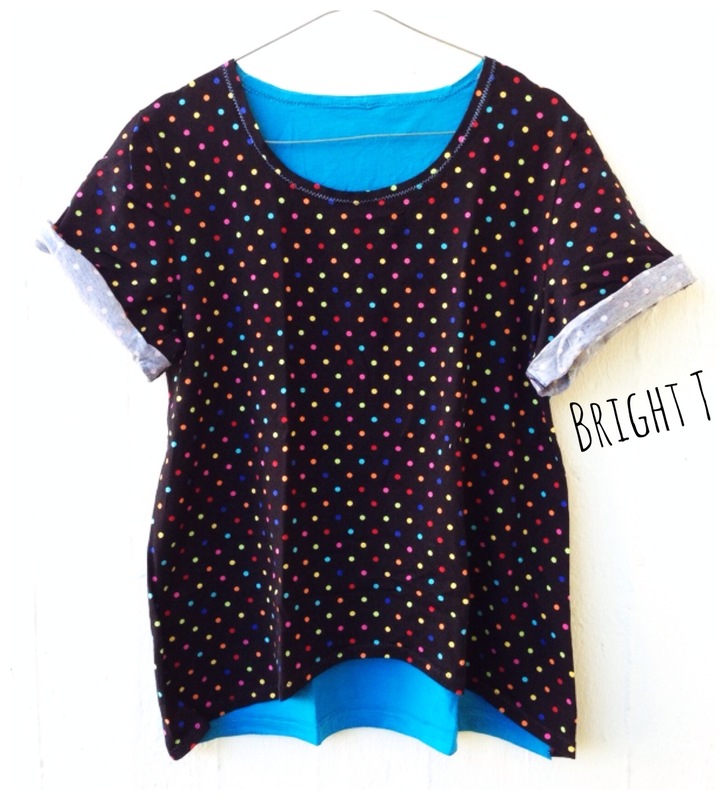 I can’t remember which one of these tops I made first, but for this one I just used a simple T-shirt pattern. For the back I used a big XXL T-Shirt I had in my stash. I regret the choice thought because I feel like a clown when I wear it, in other words: I don’t wear it out of my house. Right before my vacation started I went to my closest fabric oasis (Stof & Stil) and spent the afternoon looking at just about every bolt of fabric and buying quite a lot for my planned projects. When I sew this fabric I had no idea what I would do with it since it’s such a different quality from what I usually get (I can’t tell you what it’s called) but I new I had to have it. None of the other fabrics spoke to me the same way. 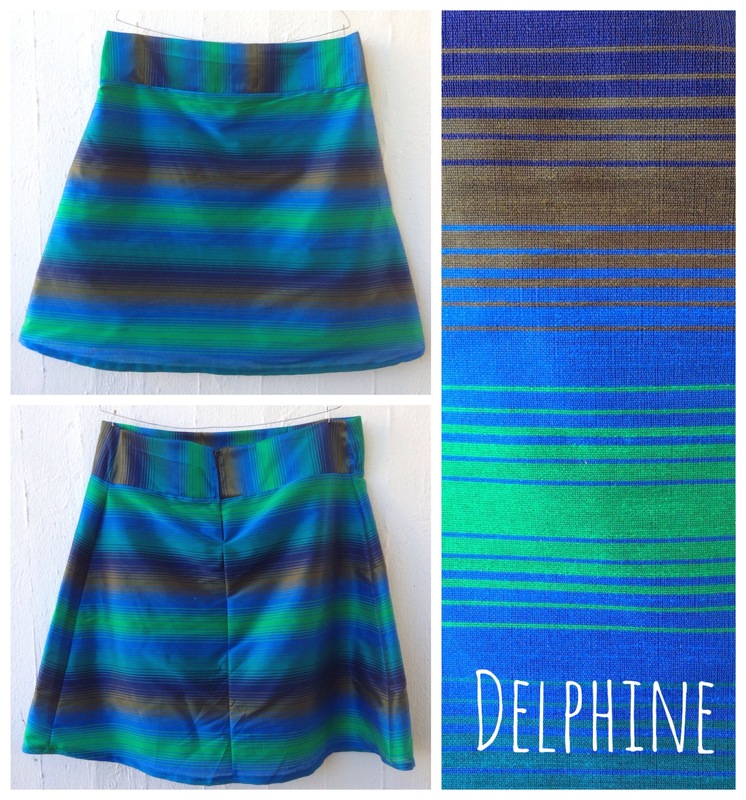 It wasn’t long after I came home that I saw the Delphine skirt in Love at First Stitch and I just started sewing. This fabric needed a lining both because it is kind of see-through and because it is kind of rough against the skin. 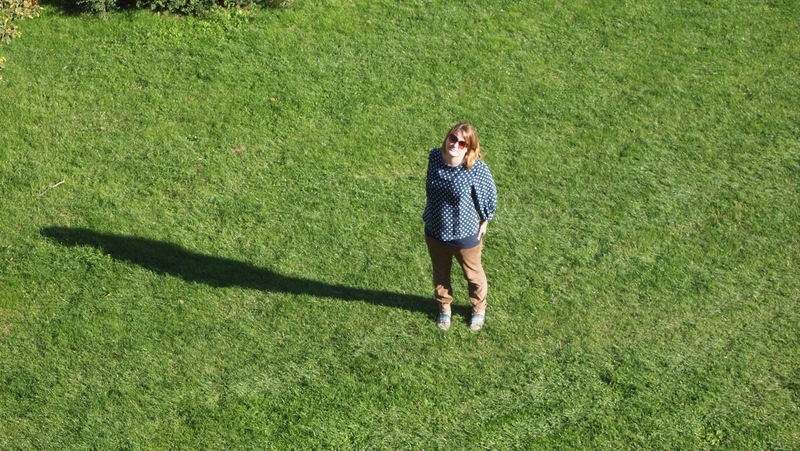 Luckily for me, Tilly had just posted this tutorial on how to add a lining, awesome! As I pretty much always do I didn’t measure enough before choosing my size so the skirt ended up being really big, luckily I realised this before I added the waistband so I just took out a few inches in the side seams, although the front ended up being bigger than the back (as you can see in the back photo). I made an attempt at the invisible zipper (in case you didn’t know, I despise zippers) but gave up pretty quickly when I realised that I didn’t have an invisible zipper foot (now I do though, thanks Mom!). I swear that some day I will sit down and really learn all I need about zippers. Maybe I’ll learn to love them like I have with dress shirts and buttonholes. I haven’t worn this skirt yet but I think it will look good later in the fall with some tights and boots and a cozy sweater (SUMMER Challenge fail by the way, oh well). 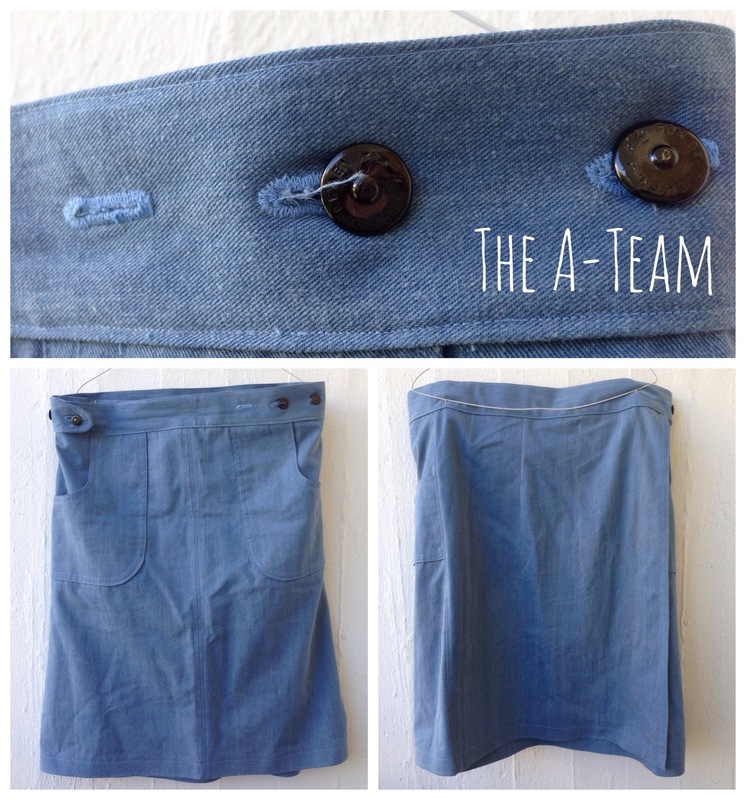 And finally my favorite piece from my whole “collection”, my “A-Team Skirt” (it’s kind of an A-line skirt, okay?). When I say favorite I don’t mean to wear unfortunately but it was so much fun to design and sew! I was going to make a whole tutorial and take some cool pictures of me actually wearing it, but that didn’t really work out, instead these wrinkly pictures will be all for now. If anyone is interested in the tutorial, leave me a comment and I’ll put it up. 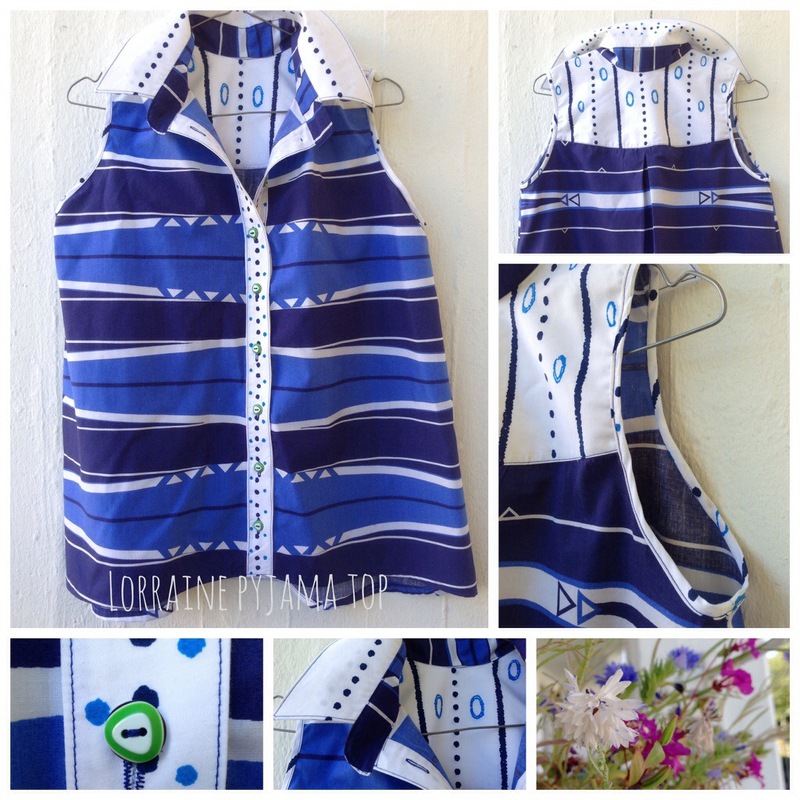 It is a wrap skirt but instead of long ties I decided to add three buttons on each side so the fit is adjustable. I was planning on ties but didn’t have enough fabric so a new idea that I liked even better came about (I love when that happens!). I found the jean fabric in my grandmothers attic when we were cleaning out after she died. I have no idea how old it it but I would guess it is from the seventies, that’s why I went with a retro styled skirt. I’ve been scared to use it (and ruin it) ever since and am pleased that I finally did it and that I like the result. 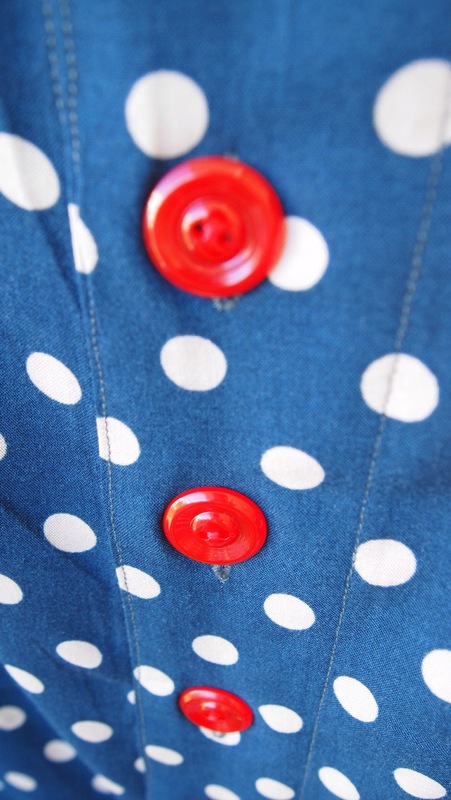 The buttons are vintage too, I got them from P’s Mom (along with like a thousand more, so nice!). I had this idea with this Summer Challenge that I would just post photos of the clothes at first and then take lots of fun vacation pictures with me wearing the clothes, but this too did not work out at the end (a big part of this was that I lived in bikinis for the first couple of weeks). I pretty much only got this picture of me wearing my first Lorraine top (this is my favorite piece to wear, definitely). 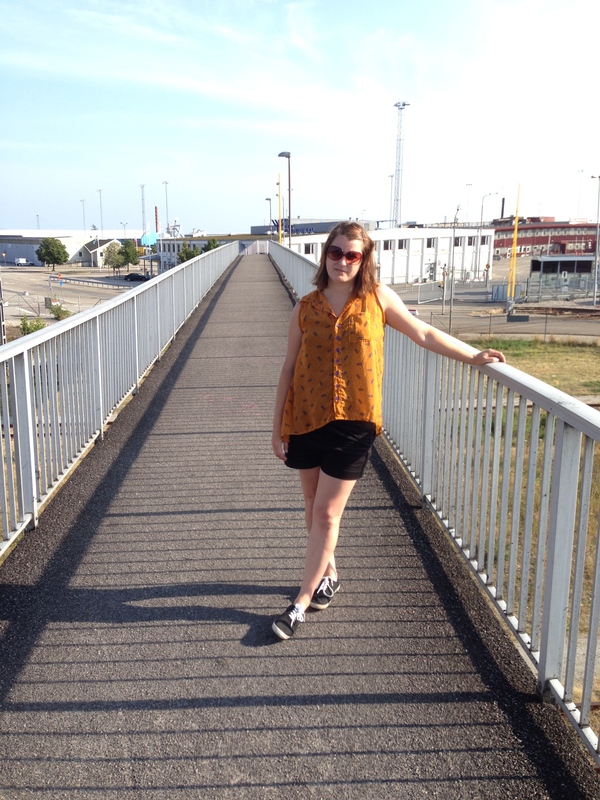 In this picture I am crossing a railway to get to the docks where the ferry to Bornholm, Denmark was. We had an awesome weekend trip there. 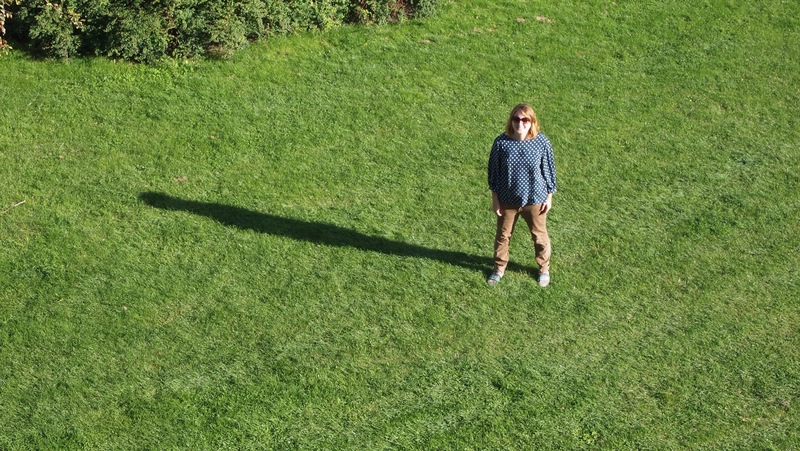 So sorry to you my readers, and to myself for not doing a better job with this challenge. But I think I learned some things and hopefully plan ahead better next time. I’ve already started sewing for my fall wardrobe which will hopefully be fun. 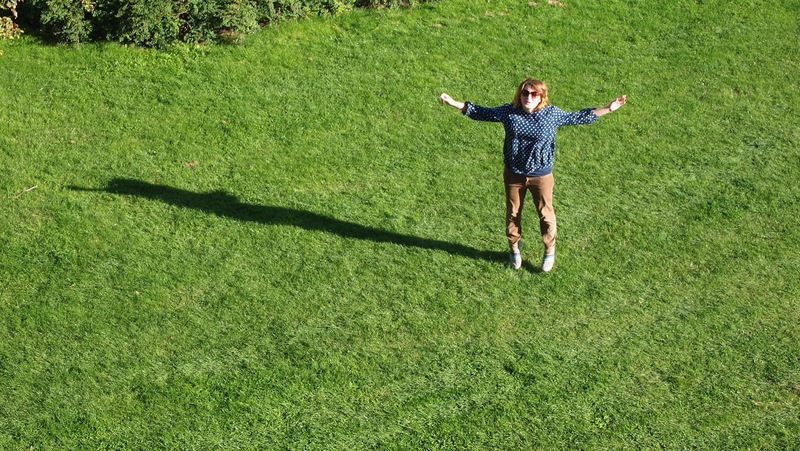 So goodbye to you lovely summer and see you next time. Categories: Burda, Home Sewn, LyllosMig, Sewing, Uncategorized | Tags: 70's Skirt, A-Team, Burda Style, Delphine, Denim Skirt, Love at First Stitch, Seventies Skirt, Summer Wardrobe Challenge, Tank Top, Tilly, Tilly and the buttons | Permalink. 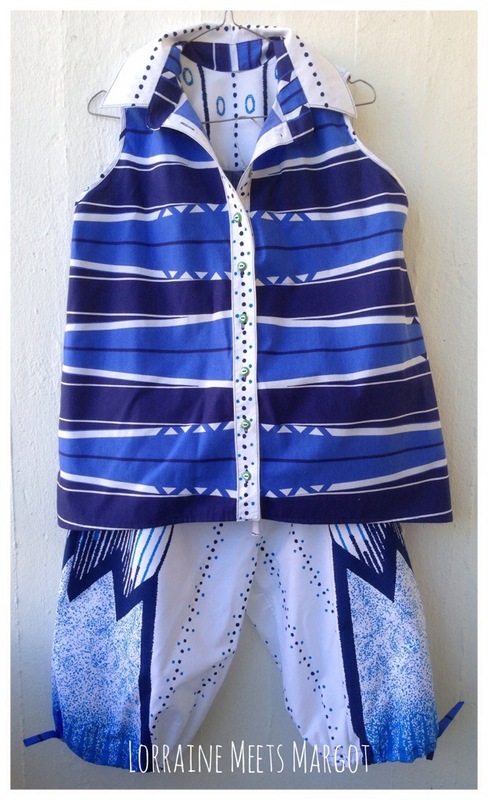 I needed a pair of pyjamas for my summer trips and was inspired by the movie “The Help” (great movie BTW) and the sixties pyjamas in one of the scenes. My local Stoff och Stil Store has a range of retro fabrics that I have been eyeing for a while and at my latest trip I found two cotton fabrics that I thought would work good together as a pyjamas. I made the top out of my Lorraine pattern, taking in the sides a bit and adding a pleat in the back instead of gathering. For the armholes I used self made bias tape. For the bottoms I used Tilly Walnes’ “Margot” pattern from her book “Love at First Stitch“. 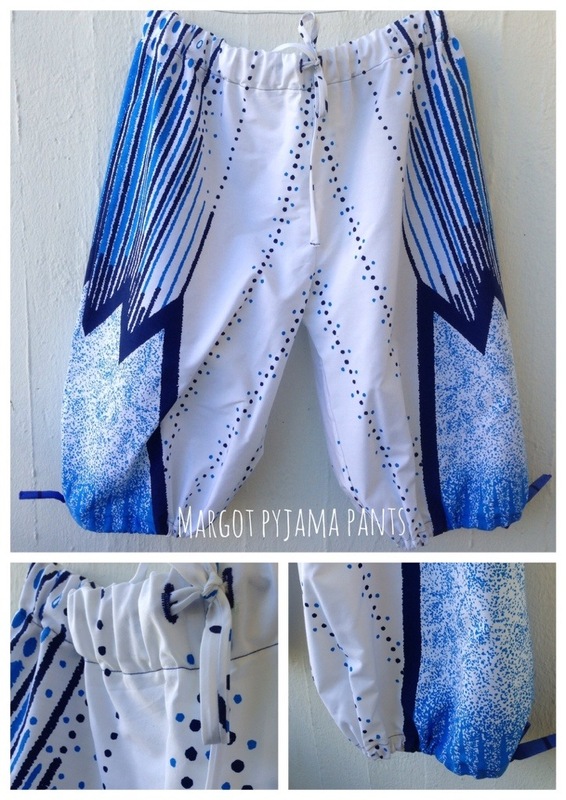 I shortened them, added an elastic in the waist and drawstrings at the calves. I’m planning to write more about Tillys book after I have tried out more patterns. Categories: Home Sewn, LyllosMig, Sewing | Tags: 60's, hand sewn, Lorraine, Love at First Stitch, Margot, Pyjamas, sixties, The Help, Tilly, Tilly and the buttons, Tilly Walnes | Permalink.